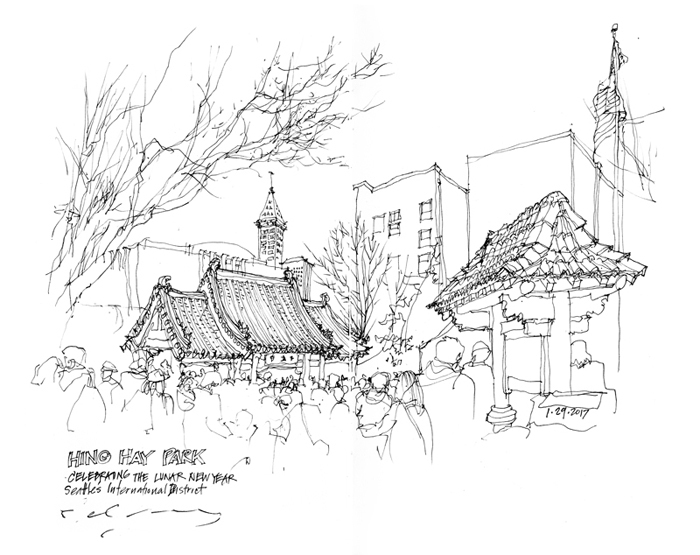 As I was drawing this view of the people gathered in Hing Hay Park this past Sunday for the Lunar New Year celebration, Mayor Ed Murray reminded us of how a mob rounded up the Chinese in this neighborhood and tried to force them out of Seattle in 1886, and how the Japanese were forced to "relocate" in 1942 (after President Roosevelt had signed Executive Order 9066). I was glad to hear Mayor Murray assert that Seattle would remain committed to welcoming refugees and immigrants in need, a view reaffirmed by the Seattle City Council last night. Beautiful drawing, and perfect to celebrate the importance of our current and future immigrant friends, neighbors, and families. Amen, Frank. I can see how wide your point of view was since I was only a telephone pole away. You took in so much of the scene, I love it.